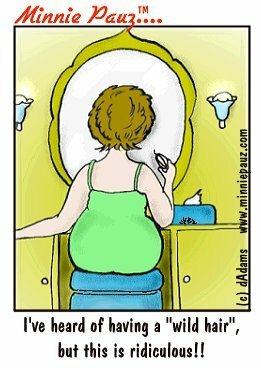 I've heard of having a "wild hair", but with menopause this saying becomes much too true. The chin hairs seem to appear every hour and it's especially embarassing if you don't notice them until one has grown to 3 inches long! Do you wax, pluck or shave? That is the question! I've been using a dilapitory cream for a few years. You leave it on for 5 minutes and then supposedly wipe it off, but I find that it misses some of the hairs and I either have to pluck or use a second time. Some women I know have found it too harsh for their skin, but it's a lot cheaper than getting waxed at a salon! Let me know in the comments below if you have a product or procedure that works for you!